Each quarter, Wilary Winn provides discounted cash flow OTTI analyses and estimates of fair value for over half of all currently active TruP CDOs. We have been providing valuations and OTTI analyses since late 2008. We were the first to posit that a deferral of payment on a trust preferred security was “not tantamount to a default” to quote a major rating agency, reflecting an industry-wide assumption at the time. On a related note, we took the position that banks who issued trust preferred securities would initially have a higher incidence of default than the historical industry average. However, based on our bank-by-bank analysis of trust preferred issuers, we believed that after this initial period, the default rate for the banks remaining in the TruP CDO pools would revert to the industry mean. This was contrary to the views of the banking regulators and major rating agencies at the time. We released a white paper in September 2011 supporting our positions. The actual results since then have borne out our assumptions and our work saved our clients tens of millions of dollars in OTTI losses. Severity of the losses on issuers that default. We perform a detailed ratio analysis of every issuer in the collateral pool, or nearly 2,000 banks, and insurance companies per quarter, believing that every issuer in the CDO must be reviewed to produce an accurate valuation. For example, we recognized that issuers subject to Dodd-Frank limitations in the treatment of their trust preferred securities as Tier 1 capital would likely prepay their fixed rate issuances. As another example, our research showed that a deferral of interest would not necessarily lead to a default. We acknowledge that until late 2010, most of the institutions that deferred ultimately defaulted. For this reason, much of the initial concern regarding the TruP CDOs focused on the institutions that had deferred and many equated a deferral with a default. We did not believe this was necessarily true based on our bank by bank analysis. As shown in the following graph, during the early stages of the financial crisis, the failure rates for the issuers of the trust preferred securities underlying the TruP CDOs we value were indeed markedly higher than failure rates for the industry as a whole. 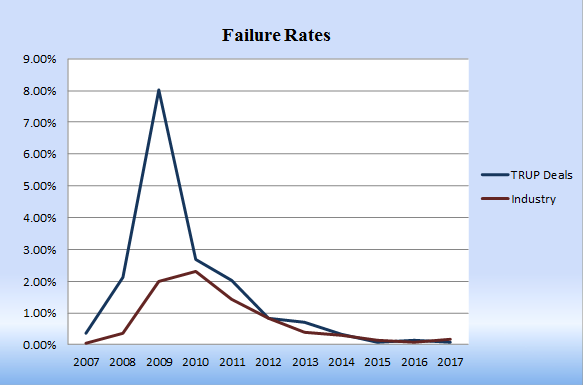 However, beginning in 2010, this difference in failure rates began to narrow significantly and since then we have seen 317 institutions cure their deferral. We thus take the time to analyze every issuer in the pool to ensure our valuations accurately reflect estimated prepayments, likely defaults, and the loss severity to be incurred on a specific default.